Howard Schultz said far-left progressives will guarantee Trump's re-election. Billionaire former Starbucks CEO Howard Schultz responded to critics Tuesday, saying that it's not his potential presidential run as a centrist independent that will guarantee President Donald Trump's re-election, it's far-left progressives. "If he runs against a far-left progressive person who is suggesting 60, 70 percent tax increases on the rich and a health care system we can't pay for, President Trump is going to get re-elected," Schultz said in an interview on ABC's "The View" on Tuesday. 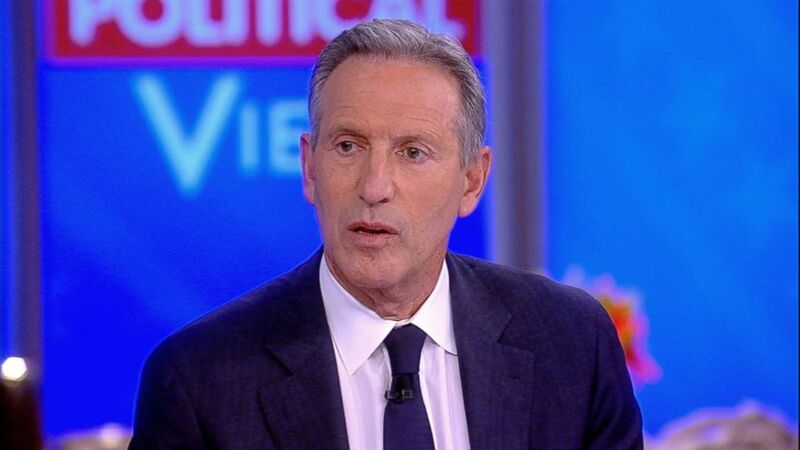 (ABC) Howard Schultz, former CEO of Starbucks appears on ABC's "The View," Jan. 29, 2019. Schultz said policies like eliminating private insurance and embracing "Medicare-for-all," which presidential candidate Kamala Harris touted Monday night during CNN's town hall, are not the right approach. They "would wipe out millions of jobs," he said. Schultz announced Sunday on "60 Minutes" that he is considering a run for president as a centrist independent. On "The View," he cited the longest-running government shutdown in history as an example of Democrats and Republicans' inability to compromise. "An independent person can break the logjam of this toxicity that exists," Schultz said. Since Schultz's announcement on "60 Minutes," he's received criticism from the president, Democrats and even hecklers at book tours. During a sold-out event in a New York City Barnes & Noble on Monday, Schultz was interrupted by a man who shouted, "Don’t help elect Trump, you egotistical billionaire a--hole. Go back to getting ratioed on Twitter. Go back to Davos with the other billionaire elite who think they know how to run the world." 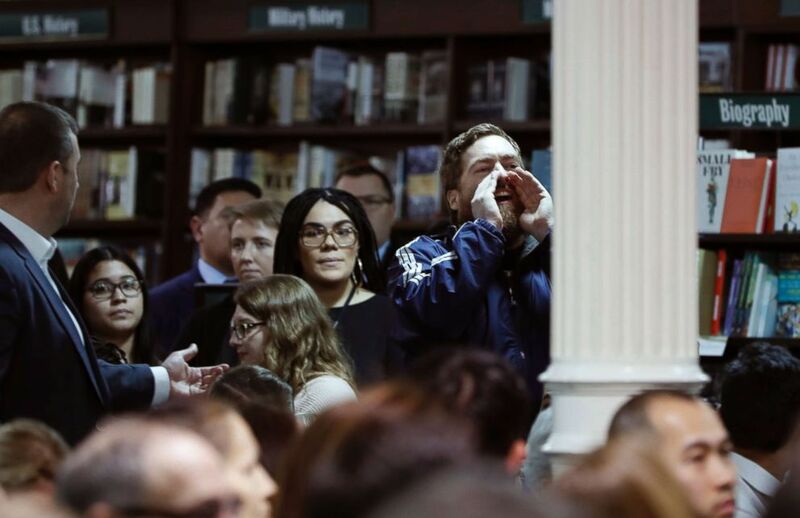 (Kathy Willens/AP) A heckler interrupts former Starbucks CEO and Chairman Howard Schultz during an appearance during Schultz's book tour, Jan. 28, 2019, in New York City. Co-host Sunny Hostin noted that, like Trump, Schultz doesn't have prior political experience and questioned why he doesn't try to gain some before running for president. "What I think I can bring is a level of servant leadership that I have acquired over almost over 40 years and what I've learned along the way. And that is sharing success with people, bringing people along with me," Schultz said. Trump fired back at Schultz's criticism that Trump is not qualified to be president in a Monday morning tweet. "Howard Schultz doesn’t have the 'guts' to run for President! Watched him on @60Minutes last night and I agree with him that he is not the 'smartest person.' Besides, America already has that! I only hope that Starbucks is still paying me their rent in Trump Tower!" Trump tweeted. "I'm not responding to that childish behavior," Howard Schultz tells @TheView when asked about Trump's tweet insulting Shultz and hoping that Starbucks is still paying him rent at Trump Tower. On "The View," Schultz said he would not respond "to that childish behavior." "And no one wants to see him fired more than me," Schultz said. "And no one wants to see you run more than him," co-host Joy Behar said. Democrats, like presidential candidate Julian Castro and potential 2020 contender Michael Bloomberg, have expressed concern that Schultz's independent run would hurt Democrats' chances and ensure Trump's re-election. 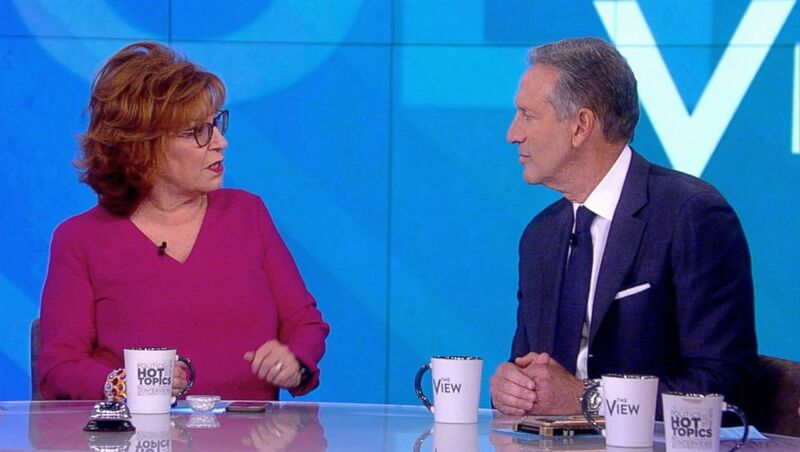 (ABC) Host Joy Behar talks with Howard Schultz, former CEO of Starbucks during his appearance on ABC's "The View," Jan. 29, 2019. Schultz, a lifelong Democrat who publicly endorsed Hillary Clinton for president in 2016, said in a video posted to Twitter Monday, "Independent is just a designation on the ballot." "The question I think we should all be asking ourselves is at a time in America when there’s so much evidence that our political system is broken, that both parties at the extreme are not representing the silent majority of the American people, isn't there a better way, a better choice?" Schultz said in the video. Co-host Meghan McCain asked Schultz, who was there to promote his new book, "From the Ground Up: A Journey To Reimagine the Promise of America," why he wasn't focusing his efforts in New Hampshire or Iowa, where most presidential contenders usually campaign early on. "Watch every Democrat go to those states and have to be disingenuous and probably make a false promise… just to be able to get elected in the primary in those states," Schultz said. "In order to run as a Democrat today, you have to fall in line with free Medicare for everybody, free college for everybody, a free job for everybody." "We can’t afford to do it free. So it has to be a different way. And the different way is corporate responsibility has to fall in line and do more for the people and the communities we serve," Schultz said. Schultz said that, ultimately, the most important task facing the country is to ensure a better future for the next generations. "Do we believe that our children and our grandchildren are going to have a better life than we do? Most Americans today believe that is not the case," Schultz said. "And that is unacceptable to me. So I want to do everything I can to restore a sense of financial security and a real belief in the promise of the country."